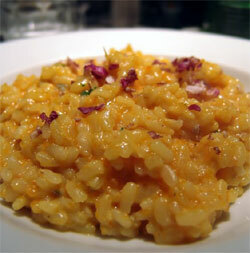 Risotto is a popular rice dish in Italy. This recipe features a saffron flavor. Soak saffron strands in one-fourth cup of warm milk. Roast peppercorns and crush them coarsely. Heat butter in a vessel and add chopped onions. Sauté on medium heat for a minute. Add and Saute rice for 5 minutes. Add 1 cup of stock along with the saffron liquid, pepper and salt and stir over low heat until the stock is absorbed. Remaining stock must be added just enough at a time so that the rice absorbs it well. Once you are finished with all the stock, the rice should be cooked and the risotto should be moist and creamy. Gently fold in half of the grated cheese. On the serving plate, garnish with the remaining cheese. Note: you can also use ukda rice in place of Arborio rice, but it should be washed and soaked for about half an hour before using.